This book was printed and distributed by The Enterprise Manufacturing Company of PA. 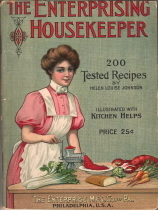 The book provides recipes and kitchen help tips, but it also contains many references and illustrations of kitchen gadgets that were made by the company. 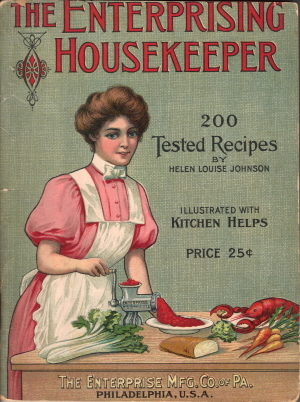 Women bought the books because of the tips and recipes, but it was also a shopping catalog that promoted the company and its kitchen tools. To review each section of the book, just click a page title below.